Join the Soaring Eagle Team! We are currently seeking a part-time or full-time individual to join our cropping and maintenance team. Duties include assisting with bedding, sand reclamation, feeding and general maintenance and cropping duties. Pay dependent on experience. Could be anywhere from 20 to 50 hours per week and will tailor hours for the right individual. Send resume and questions to soaringeagle@lakefield.net. Or call 920-726-4890 and ask for Julie. At Soaring Eagle Dairy we are committed to delivering the highest quality dairy products “From Our Cows to Your Table”. We welcome any visitors to tour our facilities. To arrange for a tour, please contact us at the number listed below. In addition, we open our land for recreational snowmobiles and hunters. If you are interested, please contact us. 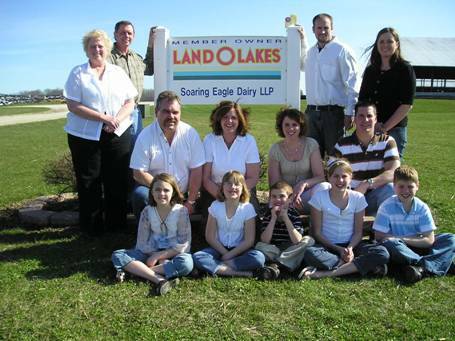 The mission of Soaring Eagle Dairy is to operate an efficient and profitable business producing high quality dairy products. We strive to be leaders, create a positive image for the dairy industry and promote personal growth and financial stability among ourselves and our employees. It is important that everyone involved in the business promotes Christian values in dealing with one another, the livestock and the environment.